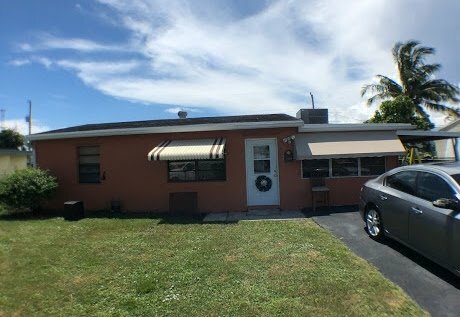 House is a 3/1 currently (3rd room not under central air), originally 2/1, has a large utility room under air that could easily be the second bathroom.Comes with a nice pool with new pump, enclosed patio in back (has a bed and window unit in it as well). Bathroom has new toilet and sink but needs tile replaced and tub updated. Has all new electrical throughout, carport has a new roof, office attached to carport, ac is 2 yrs. old. Roof 1996, AC replaced 2016 (all in one unit on roof). Carport and large driveway. Ceiling in the front left room has water damage. Needs kitchen, bath, add second bath, paint, roof, duct work to 3rd room, floor, miscellaneous.